Friday lay day – when governments act outside the law they just change the law! Its my Friday lay day. This week I have written a few (very) long blogs on what I consider to be significant topics. I have been writing on topics that have a direct bearing on what is happening within the British Labour Party over the last few weeks as a way of providing an economic knowledge base for activists who wish to defend their position against the attacks from the Tory-lites (New Labour). Anyway, after a few days of heavy writing I am not going to write much today (in blog space) and will fill this blog up with music, advertisements, promotions and a cartoon. But there is an issue that has come up this week in Australia which goes to the heart of the neo-liberal attack on our democratic rights which I can write about succinctly. The decision by a court to overturn an approval for a coalmine development has caused our neo-liberal government to go into ‘conniptions’ and accuse community groups of being “radical green activists” engaging in “vigilante litigation”. Read on to learn how the neo-liberal way is that when the government is caught acting outside the law to help their corporate business mates the solution is simple – change the law to make it easier for business to bypass acceptable approval processes. This week we have seen another layer of the way the neo-liberal governments attempt to circumvent the truth to undermine community well-being. Not content to create a ‘pro-business’ legislative environment which represses workers’ rights, undermines the income security of the most disadvantaged on income support and scrap the carbon and mining taxes, the Federal government went feral this week after a community group one a federal court case which overturned the approval of the so-called Adani Carmichael coalmine in Queensland. The UK Guardian covered the court’s decision in this article (August 5, 2015) – Approval for Adani’s Carmichael coalmine overturned by federal court. The proposed mining development is the “largest proposed coal project” ever in Australia. In its – Statement re NSD33/2015 Mackay Conservation Group v Minister for Environment (August 19, 2015) – the Federal court aimed “to correct media reports about the making of orders by the Court affecting the proposed Carmichael coal mine project”. Basically, the decision to set aside the Ministerial approval for the development was made “with the agreement of the parties to the litigation” rather than an enforcement from the court. The basis of the action, brought by the – Mackay Conservation Group – a small community group located in Northern Queensland, was that the Minister for the Environment was given advice from his own department that the development would impact significantly (negatively) on “two listed threatened species” (a skink and a snake). The Court found that “the Minister did not have regard to the approved conservation advices” – that is, he ignored the advice and acted outside of the law regarding these approval processes. So the company cannot proceed as the approval has been withdrawn. The proposed development would have been an environmental disaster quite apart from the technical grounds that the Community group used (the listed species) to overturn the approval. It would severely compromise our greenhouse gas emission targets, would use “over 12 billion litres of water per year, draining precious underground water sources” and in net terms, only promised to create 1464 jobs. The company was also accused of significantly overstating the royalties it claimed would flow to government as a result of the project. The decision doesn’t stop the mine from going ahead but it will delay it and the rumours are that the company in question is struggling with finance anyway – so the delay is probably curtains. Good riddance! The Federal government’s response to the court’s decision has been stunning. Remember, the legislative framework that these approvals function within was conservative legislation in the first place (the Howard government in 1999). And if we get to the stage where the rules are such that projects like this can be endlessly frustrated, that’s dangerous for our country and it’s tragic for the wider world. 1. “this is a $21 billion investment … it will create 10,000 jobs in Queensland and elsewhere in our country”. But the submission made by the company itself to the Land Court of Queensland said that there would only be 1,464 jobs created by the project. 2. The courts are being used to “sabotage” development and that there had been a “sustained campaign of harassment” against the project by the community. To wit: a legal challenge that highlighted the Minister had breached his own legal guidelines. The Attorney General (Brandis) went further and in his official statement (August 18, 2015) – Government acts to protect jobs from vigilante litigants – claimed that the current legislation was a “red carpet for vigilante litigation”. The Government is once against blurring the line between the legislative arm of government and the judicial arm, the separation which is at the heart of effective democracies. Courts make decisions within the legislative framework set by the government. The government itself is bound under the Rule of Law to obey the legal framework. The courts are not to be ‘pro business’ or ‘pro development’. They are there to interpret events within the context of the legal code and ensure that behaviour is consistent with that code. Then the Attorney General’ statement said the government would change the environmental protection laws to ensure that only those “directly affected” by a development could bring legal challenges. The activists themselves have declared that that is their objective – to use the courts not for the proper purpose of resolving a dispute between citizens, but for a collateral political purpose of bringing developments to a standstill, and sacrificing the jobs of tens of thousands of Australians in the process. The Government keeps quoting the tens of thousands of jobs at stake when they know in this case there were only about 1,400 jobs at best. When an environment group successfully uses 16 year-old national environmental laws to delay a project, the Abbott government tries to change the law to prevent them from ever doing it again. Today’s Fairfax article (August 21, 2015) – Abbott is losing the plot in his war on environmentalists – provides some more perspective on how crazy our national government has become. We learn that since the legislation was introduced 16 years ago, there have been 5,500 projects added and only 2 successful challenges from 33 attempts – “that’s a success rate of 0.04 per cent. Rounded up”. What this fiasco and the government’s response has taught us is that only any matters pertaining to the environment, refugees, free speech, and more the government interprets any resistance as a major challenge to the freedom of the corporations to do what they want. If the law is used to force corporations to comply then the government’s response is to change the law to eliminate that possibility. Fortunately, our upper house (the Senate) is unlikely to pass this nasty change to the environmental protection legislation. 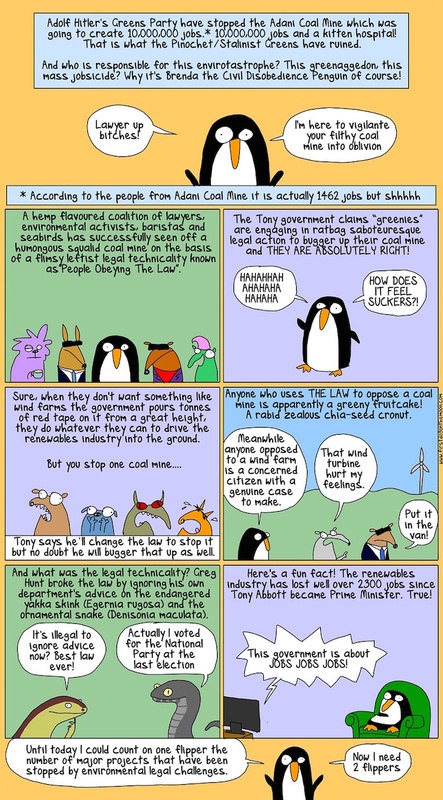 Here is the First Dog on the Moon’s take on those reprehensible – Green Vigilantes that are wrecking our economy. The Greek government’s or should I say the Hellenic Republic Asset Development Fund’s – Privatisation Program – has been leaked by a German Green member in the European Parliament. 1. The sell-off (50 billion worth of public property) is very high. 2. The Greek public “hardly knows what is being privatised” and that they have “the right to transparency”. 3. The list excludes other public assets that the Troika are demanding to be sold. Note the parasites under the heading “Advisors” – all the usual suspects ‘in for their pound’ 0 UBS, Citibank, Morgan Stanley, BNP, etc. One of the strong pieces of evidence from the now long history of privatisations is that the main beneficiaries are the lawyers, stockbrokers and investment bankers who are appointed to advise and facilitate the sell-offs. All these ‘spivs’ are once again lining up to get their hands on a share of the sell-off of the Greek assets. I have not long ago read an interesting book – Private Island: Why Britain Now Belongs to Someone Else – by James Meek (2014), which traces the tawdry history of privatisation with an emphasis on Britain. This UK Guardian article (August 23, 2014) – Sale of the century: the privatisation scam – which is based on the book is a worthy reflection on the myths and realities of this aspect of the neo-liberal putsch. Tsipras should have made his resignation permanent rather than technical (to get a new election that he hopes to win). His move to the ‘centre’ is as appalling as New Labour’s claim that they are significantly different from the Tories in Britain. The story of the transformation of the NHS is part of the wider story of the inheritance of the Thatcher legacy by a Blairite Labour administration over-filled with politicians who struggled to separate their ambitions for Britain from their ambitions for their own and their families’ ascent into the six-figure-income class. And these characters are still lining up to lead the British Labour Party … to oblivion! If you are in Melbourne tonight, my band – Pressure Drop – is playing at the 3CR Green Left Weekly Radio Fundraiser at the Bar of Bengal Room at Kindred Studio, which is located at 212a Whitehall St, Yarraville. 3CR is one of the original community radio stations in Melbourne beginning life in 1976 when the frequency band was opened by the government to allow low-cost, subscriber radio stations to take licences. It is “Melbourne’s voice of dissent” and the right-wing bulletin once accused it of being the “voice of terrorism” because it was sympathetic to the Palestinian struggle. It is a marvellous surviving example of collective action and inclusion. Tonight’s event is to mark the Green Left Weekly Radio Launch. The Green Left Radio show on 3CR Community Radio is radio for the 99%. It’s proudly independent, anti-racist, anti-homophobic, feminist, environmentalist, socialist, internationalist. Full bar and Sri Lankan feast available from 7pm. $15/$10, proceeds to 3CR and Green Left Weekly. If you want a great night then I urge you all to come down. Pressure Drop is playing from 21:15 to 22:30. This is what I have been listening to today as I worked. It is from Ernest Ranglin (guitar), Monty Alexander (piano), Quentin Baxter (drums), percussionist Courtney Panton (percussion) , Jr. Jazz (rhythm guitarist), and Hassan Shakur (bass). A fine collection of players that you could ever find. The song – Row Fisherman – was originally recorded by the Jamaican vocal trio – The Congos – in 1977. Ernest Ranglin’s instrumental version was released on his 2004 Rocksteady album. Despite moving the event to a larger venue, the organisers have now indicated there are no more seats available and a waiting list exists. If you have a ticket and for some reason or another cannot attend can you please notify the organisers via the link below so that they can allocate your place to those on the waiting list. The public is welcome to the event and there will refreshments available. I hope to see a lot of people there in Maastricht on August 31. Adani is an Indian outfit. But it is not politically correct to mention that,is it? Anyway,what’s the problem? According to most economists any Growth Is Good no matter if it trashes the planet. Exactly as some wag put it yesterday. It was nothing to do with PC. It was just irrelevant to the point being made. The scouring of the shire is inevitable under present conditions. Green groups using the legal system to nibble at the monster will not stop it. Your belief in the Westminster system is touching. PS – bringing up dubious globalist UN sponsered climate memes is problematic to say the least. No action should be taken under such circumstances as it appears all science has become corrupted by corporate interests whose primary goal it seems is to add costs to aid profitability. Taxing co2 emission at source and nationally rather then observing the holistic expenditure of energy in this now global system seems to be a effective tactic for corporate agents. The entire artifice is a absurdity of epic scale. Activism is now being used against us. At least we still have humor as a weapon. Thanks for the cartoon. Jeff, tell those critics you speak to that they can’t notice acid rain either but the Norwegians have complained about our sending them our pollution which kills their trees. Doing this only requires an extra high chimney that places its effluents higher into the atmosphere, thereby allowing it to travel to Norway. People don’t notice inhaling asbestos either. But it kills nevertheless. And you don’t need to inhale a lot of it either. This argument is idiotic. I realize that taking this approach may not work, but I don’t have a better idea. Has anyone asked ornithologists how the turbines may be rendered more visible, and unattractive, to birds? That’s good.Will not be able to resist a spot of plagiarism. The article repeats the “1464 jobs” factoid, but it’s actually 1464 “job years”, equivalent to 146.4 jobs over 10 years. Abbott should introduce JG and tax cuts but he won’t! Even if this made more profits for his business buddies. Why?